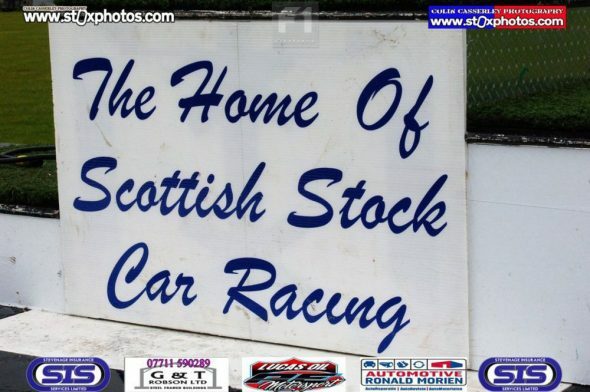 The biennial journey into Scotland has become one of the highlights of the season; a weekend which brings together the best of all things stock cars. 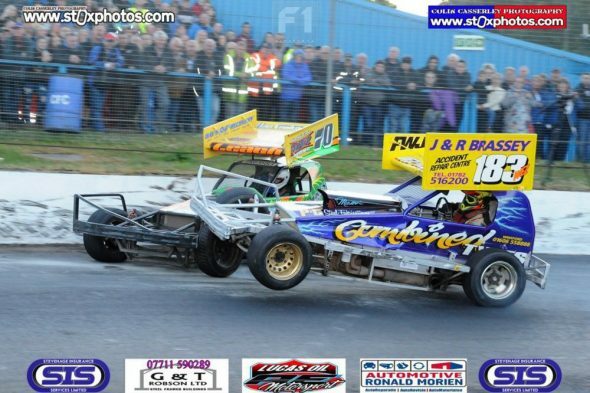 Kicking off with the traditional Cowdenbeath fixture; Saturday evening at the raceway is a spectacle; the atmosphere, incredible. 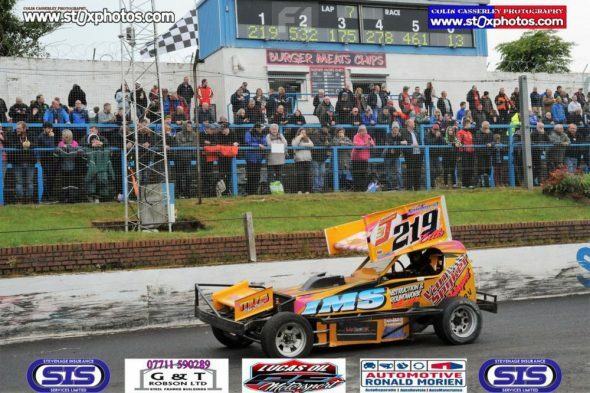 This visit did not disappoint either, a great entry of 45 cars arrived, fans packed the terraces and whilst the weather might have been less favourable at times, the action was, as ever, first rate around the Racewall. 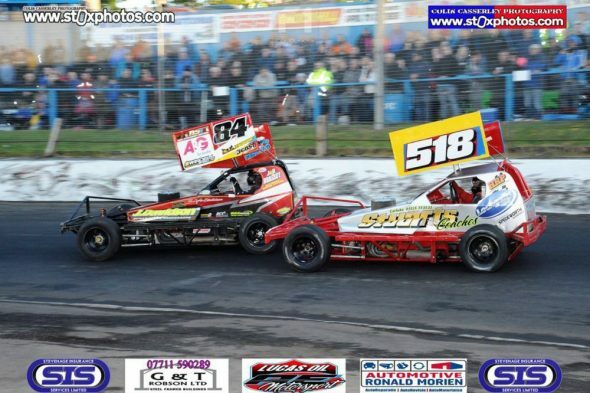 The wall, as it is on so many occasions, wasn’t forgiving on a night which saw two smart cars make their debut – Chris Cowley (37) and Martin Spiers (451). Full credit must go to the teams, the cars looked great. 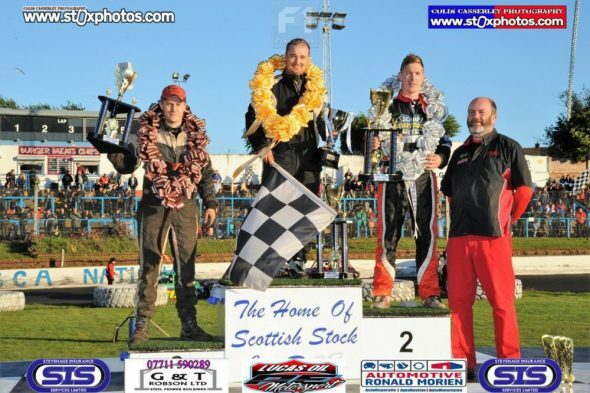 I’m not sure I would have picked the Racewall for their debut though chaps! 21 cars on track for heat 1 with Jacklyn Ellis (219) on pole. In to the first turn and the yellow graders are caught out and several smash in to the wall; including John Englestone (520), Steve Whittle (183) and John Fortune (164). The ailing cars limped across the track and caught out much of the passing pack; a clash of bumpers as they scrambled in to the back straight. Fortune ended up balanced on top of Whittle as a result. After the early skirmish, Sam Jacklin (137) was your leader; with Ellis in close contention. Ellis made a move on Jacklin and took over the lead. 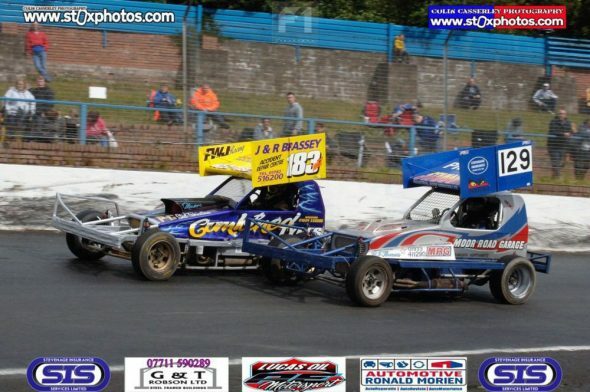 Ellis then pulled a gap on Jacklin; leaving the 137 car to battle Paul Hopkins (278) and Daz Kitson (532) for second. Jacklin ended up hard in the wall in to turn 3; which prompted the first waved yellows of the night. 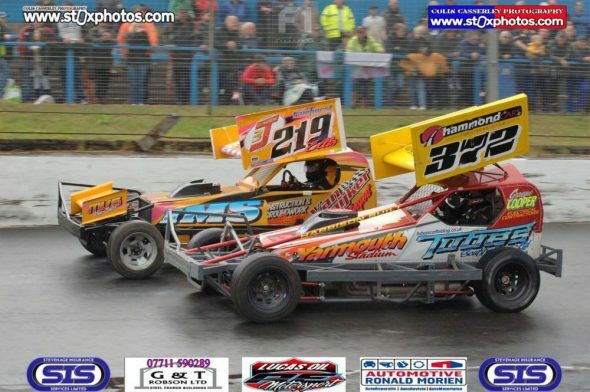 On the restart, the top three to lead them off were: 219, 532 and Karl Hawkins (175). The top 4 were all together, battling for position. Hawkins lost out on third to Lee Fairhurst (217) as Kitson tried to move Ellis wide. Fairhurst then went in on Kitson. 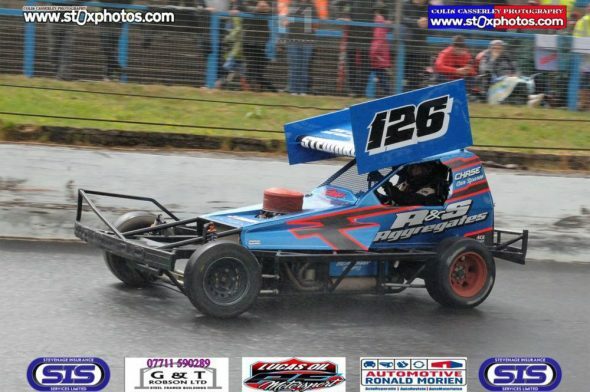 The lap boards were out and Ellis was still under significant pressure from Kitson, who, once again, tried a bigger lunge on the back of 219, but glancing off the back bumper, Kitson put himself in to the turn 1 wall. Into the closing stages and Ellis was now under pressure from Fairhurst. A slight gentlemanly nudge in to turn 3 and Ellis was on the outside, but Fairhurst clearly carried too much speed as the pair locked up and duly collected the wall. Ellis parked up and, with Fairhurst damaged and delayed, this allowed Hawkins through to take over. 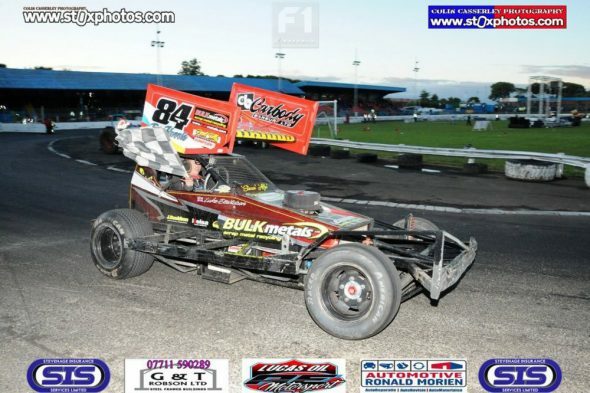 He then went on to win with Frankie Wainman (515) coming in second after a quiet race. 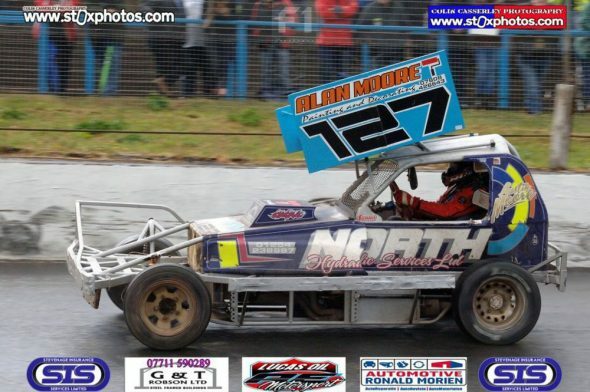 Heat 2 arrived with 23 cars on track; Martin Spiers (451) in his new car, starting pole position. 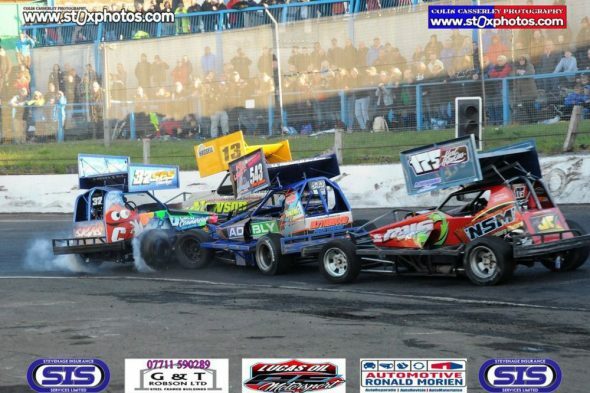 Into the first bend, much like the first heat, a number of cars went straight on in to the wall. Ronald Ferguson (437) the first there, a couple of others before Kyle Gray (124) slammed the wall too. The Gray machine, while crawling in to the back straight marker tyres, was smacked by the passing pack and the waved yellows were called for. 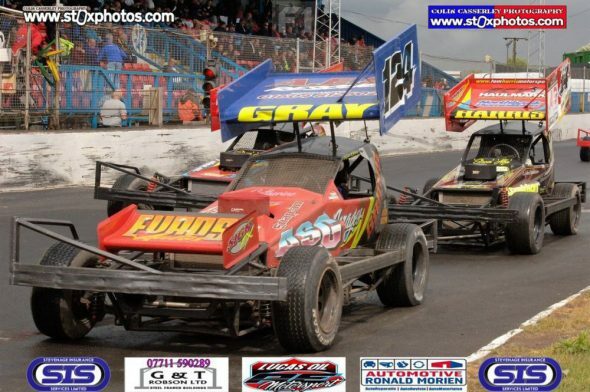 The lead cars to take the restart: 451, Stuart Shevill (518) and Wayne Marshall (483). After a slow steady rolling lap, Shevill was straight on the attack in to the first bend, but Spiers held his line. 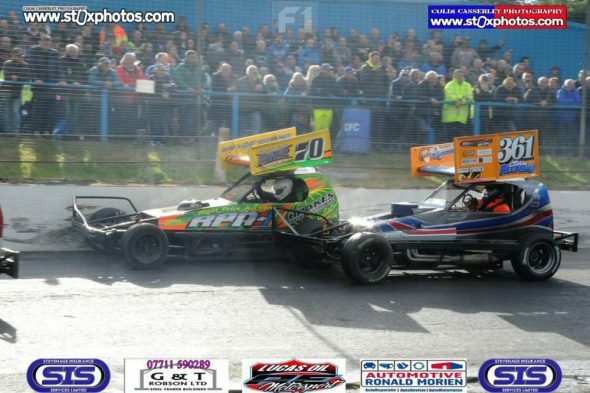 Mat Newson (16) put a shove in on Joff Gibson (249) in turn 3 as Tom Harris (84) did the same on Newson in to turn 1. Gibson, sensing opportunity, lands a hit on Newson in to turn 3; the 16 car sideways collected the wall and rode up high against the concrete; with Gibson too climbing in unison; the waved yellows called for the pair on the side against the wall. The restart saw 518, 84 and 390 your leaders. Harris wasted no time and took Shevill wide in to turn 3 to take charge of the race. 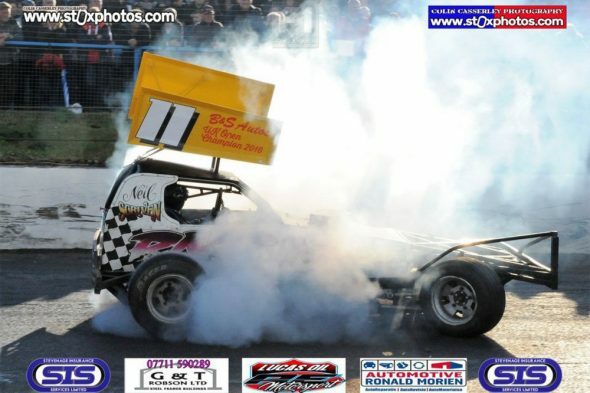 Tristan Jackson (101) was making rapid progress after a slow start and put away Neil Scriven (11) in to turn 1 in a cloud of smoke from the wheelspin. Will Hunter (220) moved past Shevill in the closing stages to take third, but up ahead it was Harris who was unstoppable in first, Stuart Smith (390) finishing second. 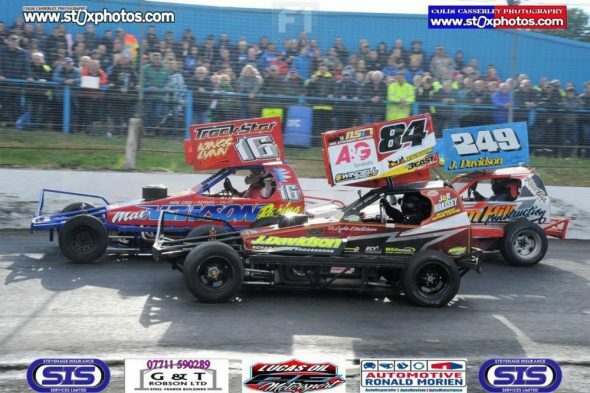 The Consolation saw a field of 17 cars on track; Ron Ferguson (437) starting on pole ahead of a tough field which included Mat Newson (16), Danny Wainman (212) and Jacklyn Ellis (219). 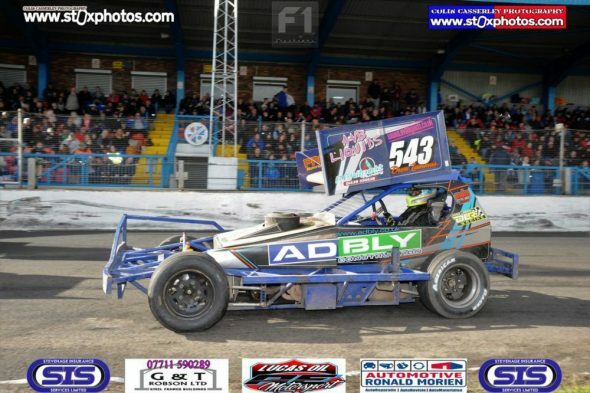 Craig Utley (484) started the race aggressively putting John Fortune (164) up the turn 1 wall; whilst shortly after Wainman put out Daz Kitson (532) in to the same piece of wall. Approaching the second half and the race settled in to rhythm; Utley moving Ellis aside in turn 3 for the lead, Ellis still struggling with damage from heat 1 nursing the car, but evidently not as comfortable as she would like and dropped down the top 10. 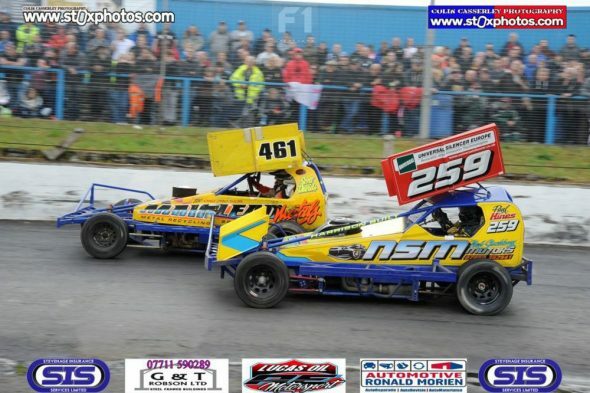 Joff Gibson (249) came up against Fortune in the closing stages; Gibson launching Fortune in to the wall in turn 3; the 164 machine sustaining damage which forced retirement on the local. Back up front, Utley led the way and maintained a big lead over Newson in second, and that’s how it remained to the flag. 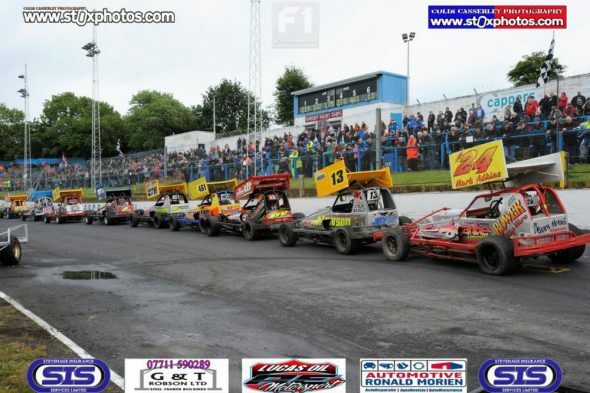 The feature final of the night, the 2018 Scottish Championship, featured 26 cars firing up on track to the sound of “Drivers, start your engines”. The atmosphere was electric with the noise of Chevy V8s filling the arena. 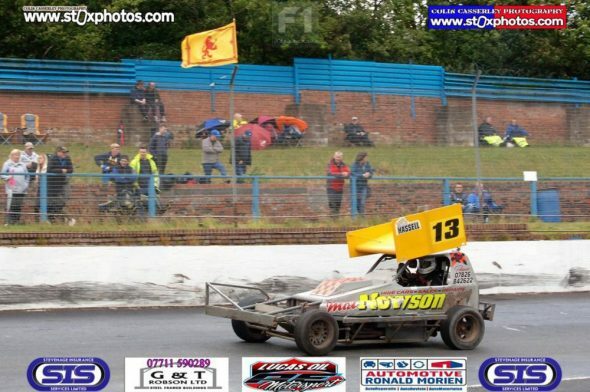 Could Tom Harris (84) take three Scottish Championships in a row? 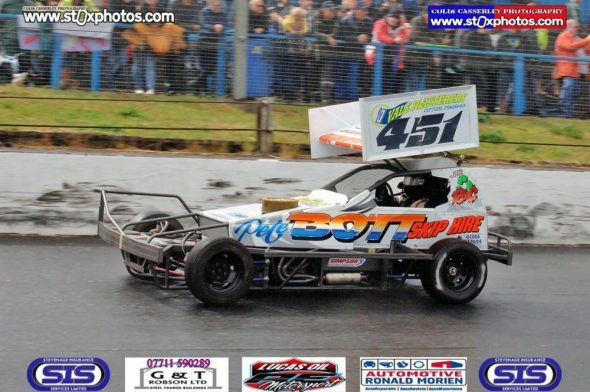 Ron Ferguson (437) starting on pole position once more led them off. 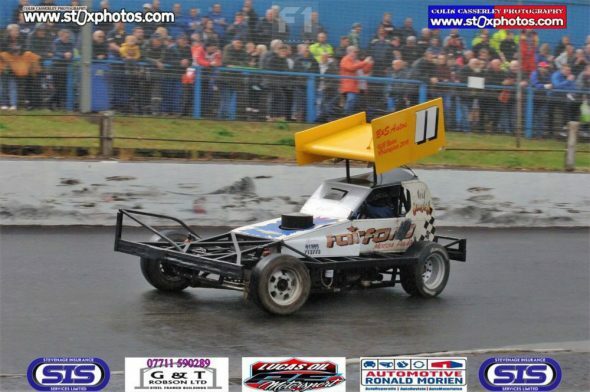 Karl Hawkins (175), Phoebe Wainman (211) and Will Hunter (220) were the first to collect the wall, whilst the yellow graders smashed in to turn 1. Tristan Jackson (101) coming off worst, ending nose on to the fence, exposed to traffic; but Jackson was largely avoided and quickly got back going. 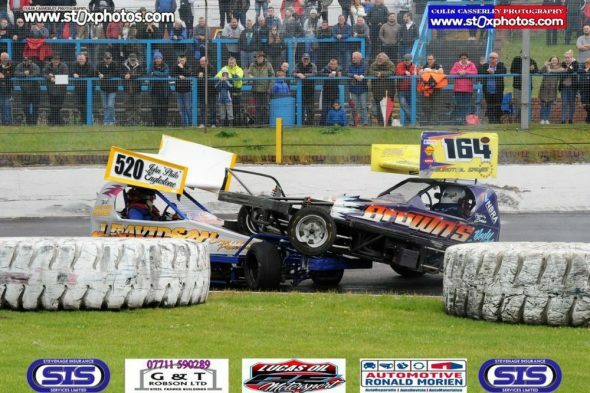 Chris Cowley (37) put in Drew Lammas (543) in to turn 1; but Cowley tripped over Lamas resulting in a brief pile up and Cowley went over the top of Lammas in to a spin against the turn 2 fence. 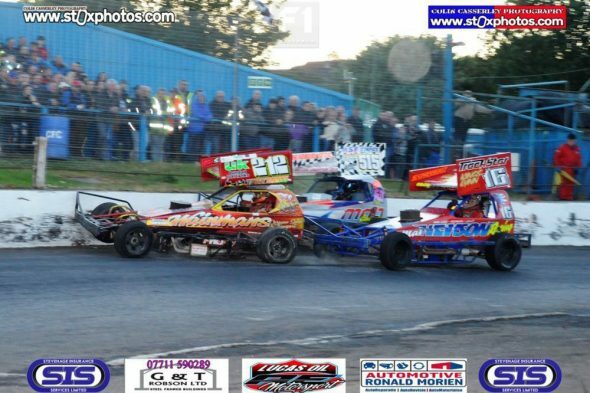 Tom Harris (84) put Frankie Wainman (515) to the wall in turn 1; as Martin Spiers (451) leads the way, Ferguson in second, followed by Craig Utley (484) and then Jacklyn Ellis (219) fourth. 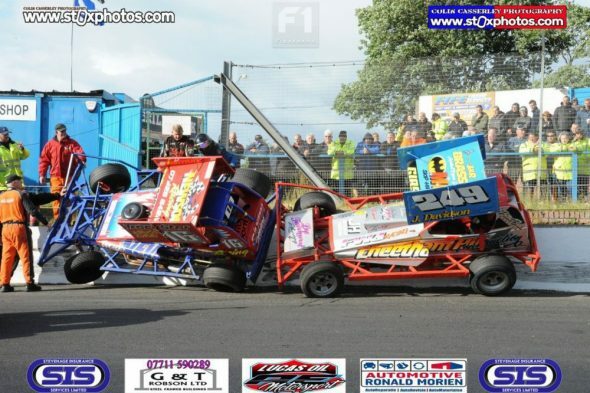 The leaders tripped over one another with some assistance from a back marker, creating a brief melee in turn 3 which saw Utley sent to the inner marker tyres. The halfway stage was signalled and Spiers still held down the lead; but such is the nature of the raceway; anything could happen and then, Spiers must have had his heart in his mouth as he nearly tripped over the Kelvin Hassell (13) machine in the home straight. Spiers unsettled, but kept going. 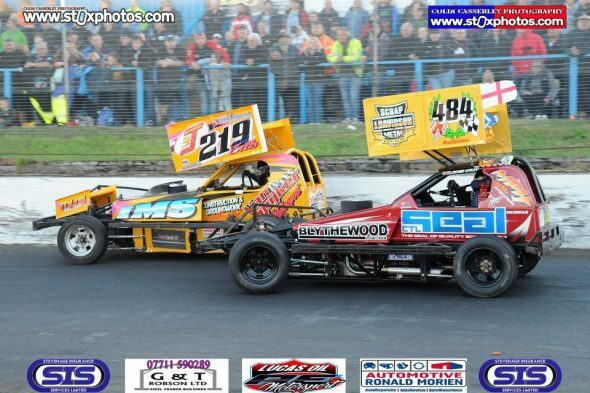 Lee Fairhurst (217) seemed to go up a gear and rapidly progressed further up the order, moving over Mat Newson (16); whilst Ashley England (346) was sent out hard in to the wall in turn 3. The lap boards were now presented, Spiers holding a lead over second place Stuart Shevill (518), but the gap closing, with Harris charging hard on both, in close contention in third. 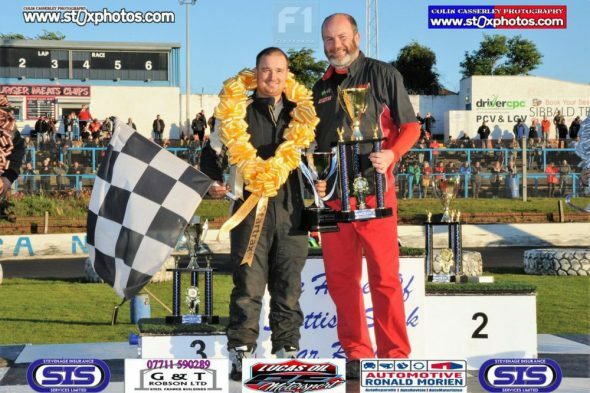 Harris bumpered Shevill wide to take second – it was looking ever more likely of an 84 win. 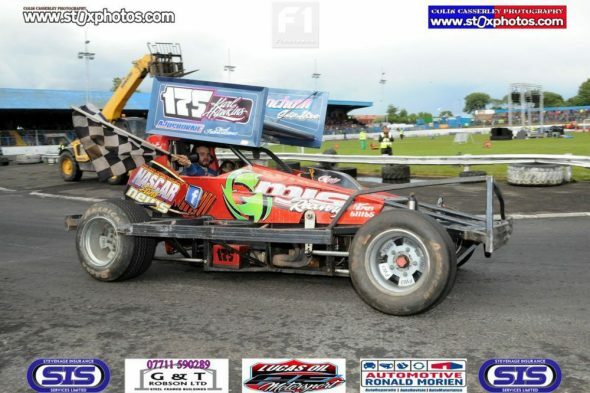 Fairhurst then did the same to Shevill moving over the 518 car to take third. 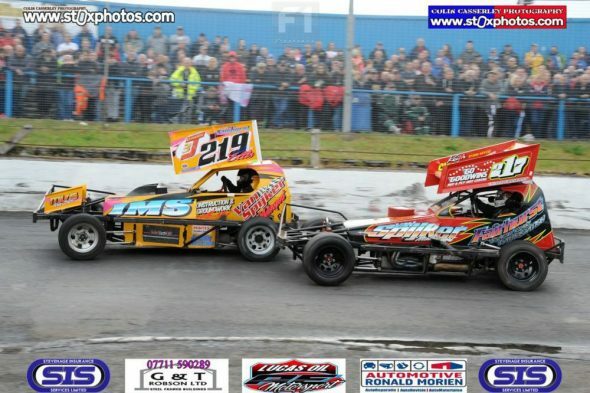 At the chequered flag though, Spiers held on for a remarkable, unexpected win; Harris not close enough for last bender. 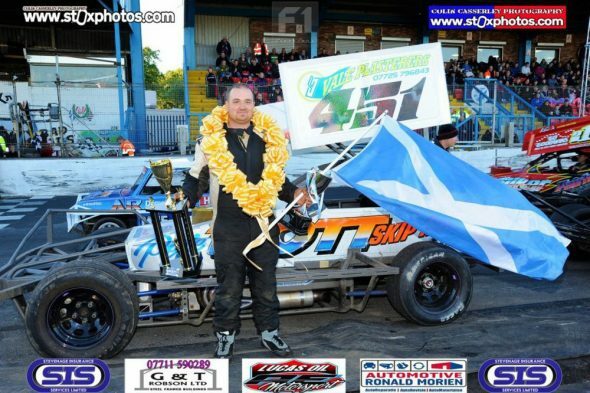 Spiers becoming the first white grade Cowdenbeath F1 final winner. 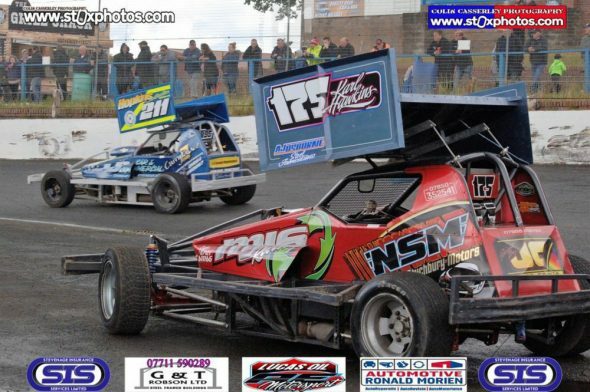 25 cars returned for the Grand National event; Martin Spiers (451) taking the half lap handicap. 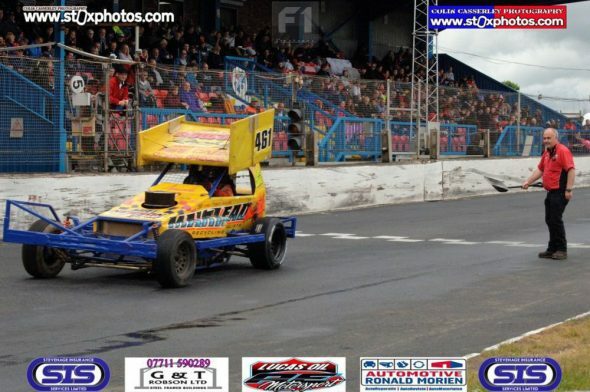 Ron Ferguson (437) starting on pole position for the final time. 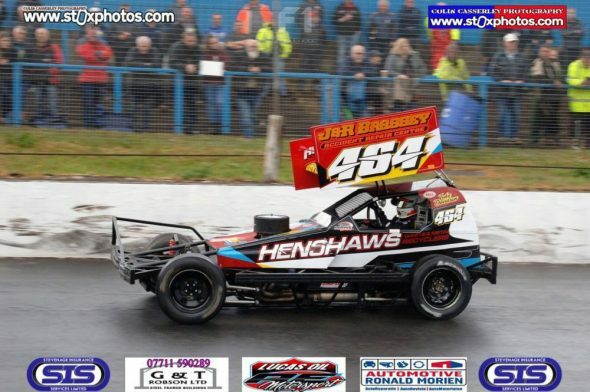 Craig Utley (484) once again aggressive at the start put away Steve Reedman (361) out hard to the turn 1 fence as Lindsay Wilson (461) went out to the home straight marker tyres; waved yellows were called for. The restart saw Sam Jacklin (137) lead them off. At the green, Karl Hawkins (175) put away Tristan Jackson (101) to the turn 1 wall, with Wayne Marshall (483) on his outside and nowhere to go when Jackson hurtled to the wall; Marshall went up riding the wall, rolling in the process. 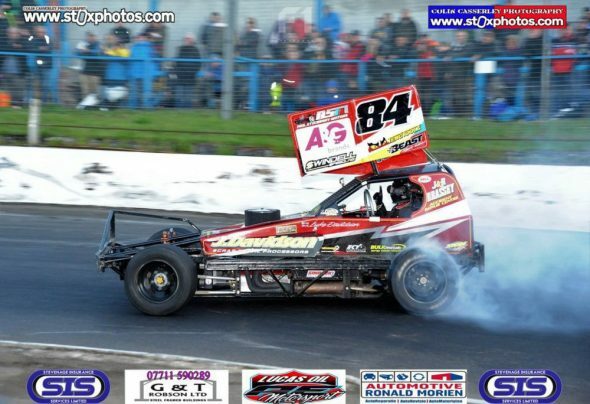 Wilson, unable to avoid, went in to the back of the 483 machine; thankfully all were ok.
Another waved yellow period, this time it was Stuart Shevill (518) leading the way, Jacklin in second and Steve Whittle (183) in third. 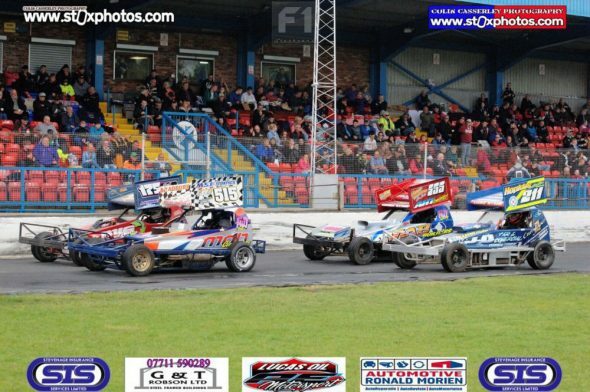 On the restart and Tom Harris (84) shunted Frankie Wainman (515) wide in to turn 1; with Lee Fairhurst (217) offering the same to Wainman a lap later. It was the halfway stage and Shevill still led the way, a blisteringly quick Harris now in second and Hawkins third. Harris reeled in Shevill in the second half, taking over the lead as the lap boards were presented. 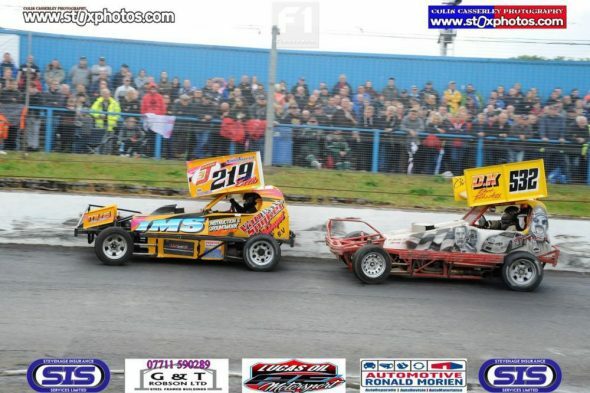 Further back and Danny Wainman (212) was enjoying a closing race battle with brother Frankie and Mat Newson (16). Danny bumpered Frankie; the pair clashed in to turn 1, rattling the wall. Harris, clear in front at the chequered flag, took the win; again a hard-charging Fairhurst saw him climb positions at the close finishing second; but in to the last bend 515 went for a big last bender on Newson, Newson clattering the wall; 16 quickly tried to get himself across the racing line; but he had no option to follow Wainman by the flag.